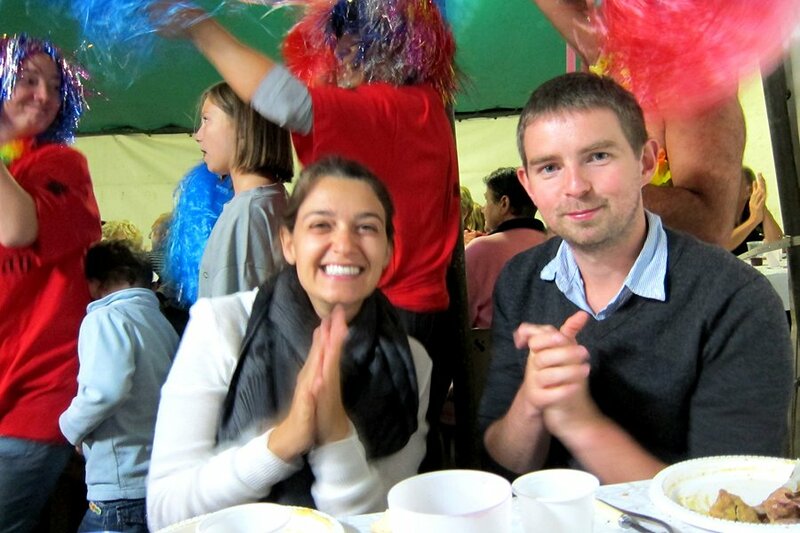 The author and her fiance at a feast made for a village. All photographs by Kerry Saretsky. As Fashion Week picks up in Paris, we head south for some counterprogramming: a giant village feast. You know, that other thing that the French do so well. SAVERDUN, France – Last summer, I spent three weeks in a rented house away from it all in the tiny little town of , a speck on the map about an hour's drive from Toulouse in southwestern France. 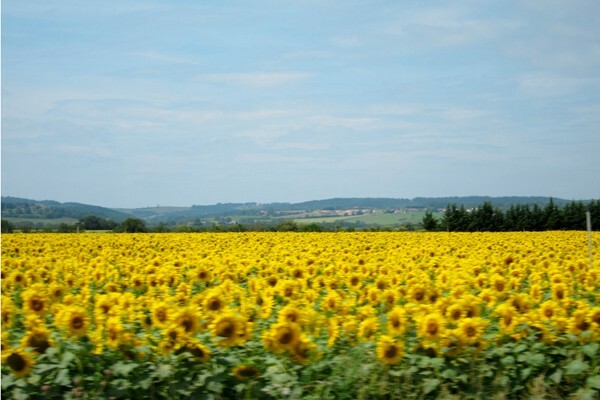 Nestled among the rising and falling hills spangled with sunflowers, it is the perfect one-street French town, the kind that makes you wonder if anyone still lives there. We made it home base and drove to Carcassonne and Castelnaudary for cassoulet. Into Toulouse for shopping at Sandro and Petit Bateau. 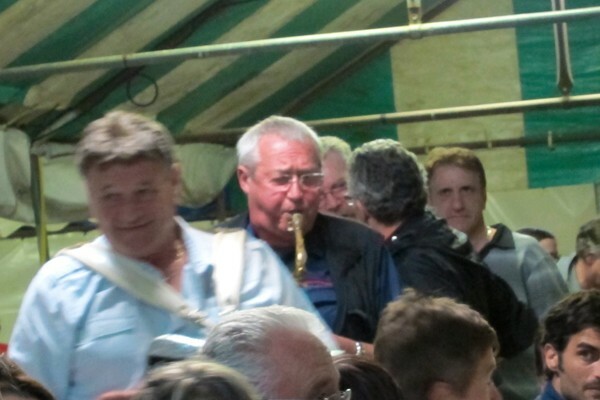 Into medieval villages to buy vintage posters and eat accompanied by accordions. 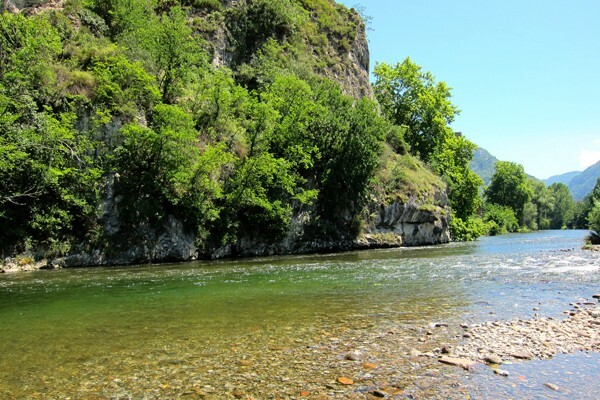 And along rambling rivers that petered down from the Pyrenees in little two-person canoes. I have never seen anyplace so beautiful or so different from the rest of France as I knew and loved it. 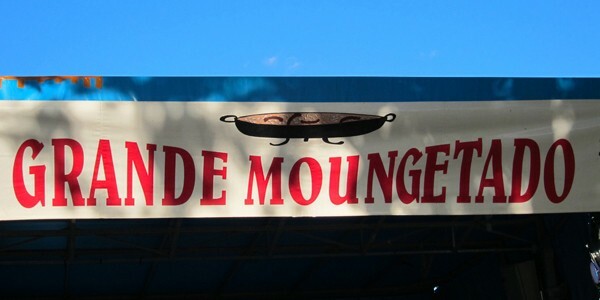 Towards the end of our stay, we started to see banners go up in town promoting La Grande Moungetado. Beans and sausages danced across the banners. As a food writer, my interest was piqued. I had already been converted to the wonder that is cassoulet, eating it four out of five nights, despite the July heat. I couldn't help but wonder if moungetado was cassoulet's cooler, hipper, unspoiled cousin. Mais, que est-ce que c'est? I asked a local what moungetado was. "You know," he replied in his accented French, "beans and sausages!" Bien sûr. How could I be so stupid? So I figured that indeed it was cassoulet's cooler, hipper, unspoiled cousin and convinced my mom, stepfather, and fiancé that we had to spend our last night in Saverdun experiencing it. "We'll go for a little while," I insisted. "If it's awful, I'll take you all out for cassoulet." The following night we followed signs to the chateau. It was somewhat confusing, as Saverdun's chateau burned down more than four centuries ago, yet the hill where it stood is still called "the chateau." Eventually we arrived at the top of a grassy hill overlooking sunflower-spectacular hills. 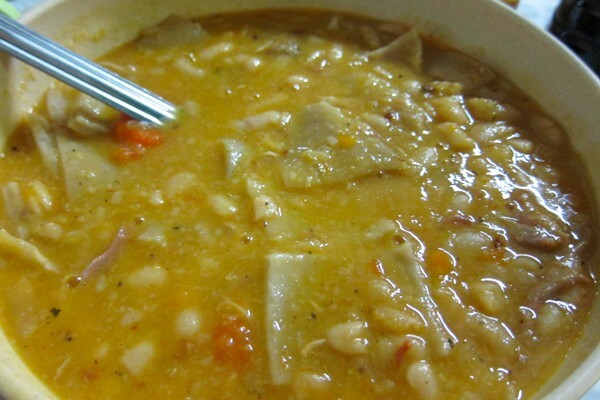 In case you haven't guessed, the Grand Moungetado is not cassoulet's cousin. It is a feast held every summer in Saverdun on the site of the old chateau. The entire town attends. Indeed, the entire town was lined up waiting patiently to get into the most charming and enormous of carnival tents. 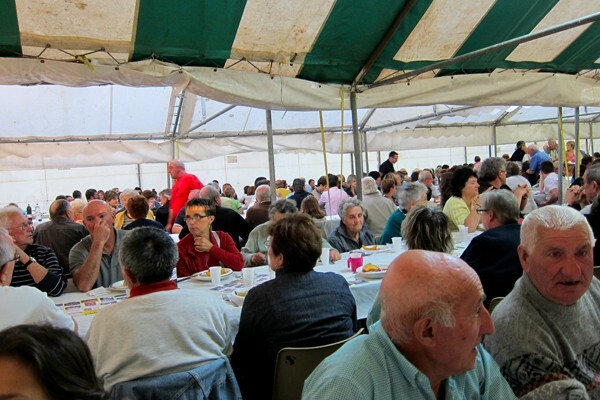 The beans and sausages were dancing on the banners because it is a cassoulet feast, and it was a feast that was sold out. My mother is a classic haggler, and, while my step-father and fiancé hid in the car, she (with me chirping excitedly) wrangled four tickets for 13 euros apiece. When some nice people learned that we were not from the Saverdun region, the town insisted that we enter as guests. It was a kind of medieval chivalry that I had never before witnessed, but that I was to experience over and over again that night. We were seated at long, long tables inside the tent. The locals had brought their forks and knives with them, but the president of the festival bestowed special sets on us, his guests. For thirteen euros, we were served pate, melons and hams, and cheeses. Aperitifs were served in little plastic cups. Then cassoulet. First the beans and sausages were served in big bowls along the center of the banquet tables. We shared with our neighbors, who laughed, and couldn't believe we'd come from far and wide to be ... here. We were seated next to two old salts from the Algerian War. One cut his meat with a Laguiole pocketknife; the other laughed like a bomb explosion. He was missing a few teeth. 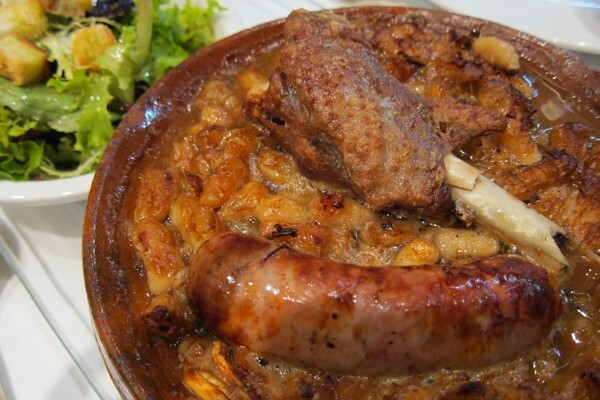 Then came a second round of beans and sausage, followed by two rounds of duck confit served separately from the cassoulet in which it had been stewed. The baguettes were neverending. 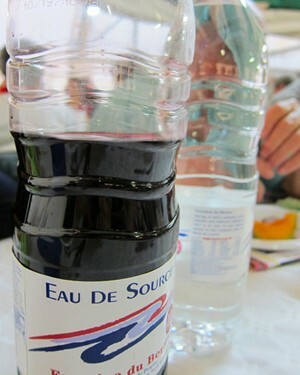 The wine was served in recycled plastic water bottles that were continually replenished. The laughter was deafening; the conversation a din. The feast was rounded out by more salad, more cheese, fruit, dessert, and dessert wine. When I asked where the bathroom was, one of my neighbors pointed to a giant uplit cross that marked the resting place of the defunct chateau and told me to find an unlit tree nearby. Between the medieval recipes, the tent, the chivalry, and the simplicity of it all, I felt as though I had fallen ten centuries back in time. The experience was way better than anything I could ever write about it. In fact, we're modeling our wedding on the Moungetado. Because although I have eaten in many much fancier and more refined places, I have never had a better meal. Nor a better night. - The book I was reading is all about medieval feasting. - Old paintings and stories. Relive the banquets! 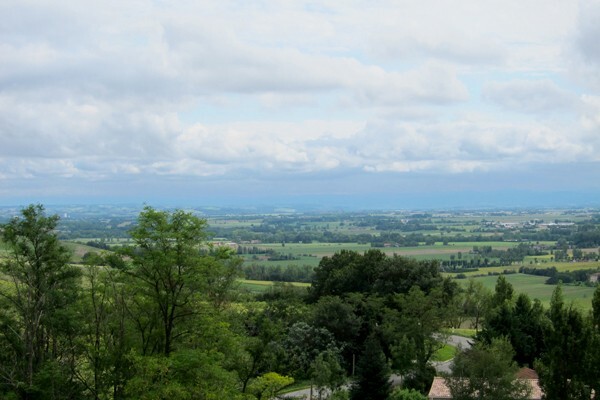 - An ode to French food, wine, and landscapes. Kerry is a writer, eater, publishing strategist, and founder of French Revolution (the blog, that is). You can follow her at @KerrySaretsky on Instagram and at @FrenchRev on Twitter and . She travels for the chocolates on the pillows.